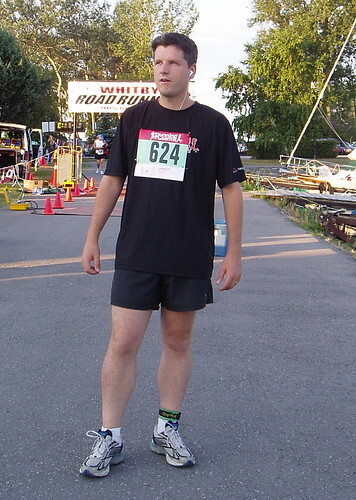 Early this morning, I ran the second 5k race of my life. I ran my first race, the Hazel 5k, in 27:50. With ten more weeks of running under my belt, I was looking to annihilate that time before I move on to the 10k. 5:20am - My alarm was actually set for 5:25am, but my mental alarm went off five minutes earlier than that. I quietly showered, dressed, grabbed my camera and iPod and hit the road. The 401 was nice and empty, and my thoughts drifted to July 29, 2004 when I was driving Toronto streets in the early hours of the morning. This time there was no transport back to the 1930s, but it was calm and serene and I was in Whitby before I knew it. 6:20am - At the check in table, they gave me a badge to pin to my shirt and a hat. I had forgotten I wasn't getting a tee shirt. I'd wear the shirt, but when the hell will I ever wear the hat? I was directed to another booth where I picked up my tag. Unlike the Hazel 5k, this was a strap you velcroed to your ankle and I don't think it was going to feed the results to a web site. The 5k was set to start at 7:45am, so I had a solid hour to kill hanging out by the boats and water and psyching myself up. My buddy Tim showed up. He lives in Whitby, and I mentioned I was running this race. He decided he'd run as well. I asked him if he ran at all and he told me he used to run but hadn't run in about a decade. Tim was about to learn it's not nearly as easy as it looks. 7:45am - I run faster when I'm running with someone who pushes me. I ran this race alone, and I think it hurt my time. Yesterday morning, I ran a fast 5k, which was probably a bad idea because I didn't feel particularly fresh and zippy during this race. I felt slow. My plan was to sprint with a kilometre to go, something I've done quite successfully during training runs, but when I hit the 4k mark I just didn't have that extra gear. My target time was 24 minutes, but I started to think I might be able to go even faster. As it turns out, I was barely under 25 minutes. That's 3 minutes faster than my first 5k race time, but I know I can do better. 8:45am - I waited for others from the High Park Running Room to finish, and then we enjoyed brunch at the Whitby Yacht Club. A couple of bagels, some water melon, orange juice and coffee while overlooking the water was a great way to wind down after my second run. The chow was part of the race registration, which almost made up for the fact they didn't give me a shirt. Here's the Flickr photoset. It's not yet noon, but I feel as if I've enjoyed a full day. My next race is The Terry Fox Run and then a 10k through the Toronto Zoo. That will be cool. The times did make it to a web site. Congrats on the time Mike great progress. I must have missed you, as you were ahead of me the whole time. I was bib# 724 my chip time was 26:26. Maybe you saw me pre race. I was wearing a torn up white Nike baseball hat. I see you were in my category... thanks for not beating me. I owe ya one.